In the 1730’s, there began a movement in the Colonies that was later called The Great Awakening. It came with convincing preachers, stirred spirits, changed morals, and huge revival meetings. It transformed the religious and moral landscape of the soon-to-be American colonies. Some even consider the religious fervor it ignited as one of the causes of the American Revolution. It had a huge impact, but the effects eventually wore off. By 1790, there was a Second Great Awakening, filled with a whole new round of hellfire and brimstone sermons, new converts, and more moral reform. This too, faded away until there was a Third Great Awakening in the 1850s. This pattern of revival and indifference is nothing new to the church on earth. There is a tide that ebbs and flows of reform and unfaithfulness that washes through the generations of the fallen sons of men. So, on this Reformation Sunday, we will consider the wisdom the Lord Himself teaches about the success of His Word in the hearts of mankind. The very first big reform for the Church happened in the Exodus. The descendants of Jacob were suffering under the yoke of slavery in Egypt. God sent them Moses to deliver them with mighty acts of judgment against Pharaoh and Egypt’s idols. In the very first Passover, all of Israel carefully obeyed the Lord’s instructions, and they were preserved from the final plague of death of the firstborn [Ex. 12:23]. Moses brought them through the Red Sea on dry ground, and the sons of Israel became a people for God’s treasured possession [Ex. 19:5]. The whole assembly took part in God’s rescue, as St. Paul much later wrote, “Our fathers were all under the cloud, and all passed through the sea, and all were baptized into Moses in the cloud and in the sea, and all ate the same spiritual food, and all drank the same spiritual drink” But that ideal picture of God’s people didn’t last long. They soon succumbed to grumbling against God, rejecting His called servants [Ex. 16], and even outright pagan worship practices [Ex. 32]. This cycle of faithfulness and apostasy continued, generation after generation. There were glimpses of a perfect company of God’s people, and then hopes would be dashed. It even seemed that some final victory had come under the reigns of King David, and his son, Solomon. But even their reigns came to an end in division among God’s people. When John the Baptist finally appeared in the wilderness, a reformation of a different kind erupted. It wasn’t different because of the participants, because they were just as sinful and stiff-necked. It was different because of what the Lord Himself was going to do. It seemed even more like that was the case once John announced, “Behold, the Lamb of God, who takes away the sin of the world!” Great crowds flocked to Jesus and followed Him as He preached and healed, and countless people were forgiven of their sins, healed of their diseases, and cleansed of their leprosy. Yes, there were great crowds who followed Jesus and believed in Him. But that isn’t reformation in the Lord’s sight. The kind of reform which God has always been after is those who listen to His Word, not those whose hearts are far from Him. The real reformations which cause joy before God’s throne take place every time a sinner repents. That’s when His Word accomplishes the purpose for which He sends it. This kind of reformation is based on faith, and continues by the work of the Holy Spirit, when and where it pleases God (John 3:8). There may be a huge initial response, and the appearance of the whole world being converted, but those things will pass. What was visible for a time will become invisible. Yet, the reformation will continue in those who “have ears to hear” (v. 15). Surely this is disappointing to witness, especially as we sit in naves (sanctuaries) that are far from filled to capacity. But this doesn’t mean the purpose of the Lord is not and has not been fulfilled. When I talk to people who haven’t been at church for a while, they ask me, how’s the attendance at church? Stupid me, I give them numbers. As if the attendance numbers really said anything about the Church, the creation of Holy Spirit. The trouble is, we are so susceptible to thinking of the Church in terms of our work. After all, the devotion is ours, our hands did the work, and we’re the ones who have spent time in and among this congregation. I mean, I wrote this sermon. There’s a certain comfortability with measuring the success or failure of the Church in things that can be observed and quantified. So, if the attendance is down or the finances aren’t what we expect, it’s so easy to think that we’ve failed. 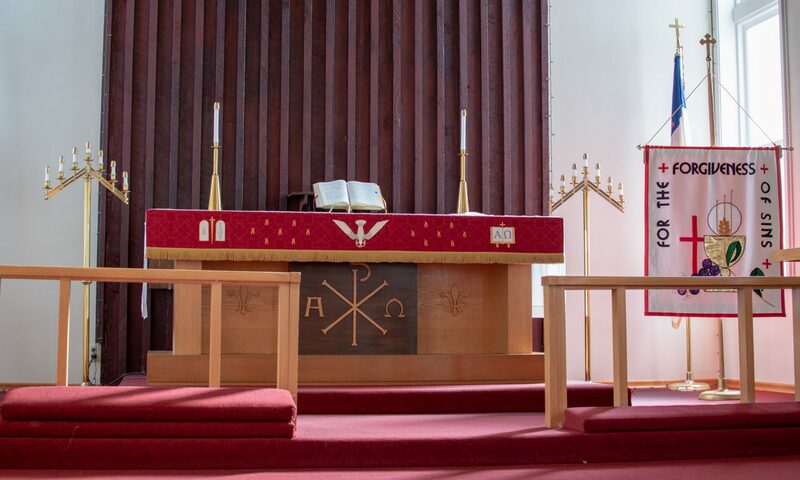 Why won’t people come to our church? When it gets really bad, we start pointing fingers and assigning blame. As the Lord’s servant, it’s my duty to tell you that is a losing game. Losing not just in the sense that it might become a failed venture, but if that’s the aim of our hearts, then we are likely thinking of it as something besides Christ’s Church, a visible gathering of the Kingdom of Heaven. Think about it this way: On the Last Day, what is the Lord going to say as He welcomes His own into glory? “Well done, you made the church grow threefold…you got 3/5 of your grandkids to come to church…” No, He will say, “Well done, good and faithful servant. You have been faithful over a little; I will set you over much. Enter into the joy of your master.” (Matt. 25:21) He calls each of us to faithfulness as servants. God grant that our labors be done in service to Him, because He will give the increase as He sees fit. So, for us servants, we need to stop worrying about attendance numbers and quit fretting over sustainability for individual congregations. Because it’s His Church and His work, it might go in a direction we don’t expect—even down—and that’s fine, so long as we have been faithful servants. What truly matters is God the Holy Spirit gathering the faithful around their Lord, and He will do that in spite of all earthly obstacles. He will do that when and where it pleases God. All of the praise and the success belongs not to us; it belongs to Him! Twelve years ago, on Reformation Sunday, a revival and reformation happened in a man who grew up knowing nothing of God and His Son. Although several times the Word came to him, he was unmoved. But in God’s timing, that man came to know the Lord and he confessed his faith before Trinity Lutheran Church in Bellingham, Washington. Again, by God’s continued grace and the powerful working of His Spirit, that man stands before you as your pastor. This Reformation Sunday, we are privileged to witness the Word of the Lord at work in the hearts of Jerimiah and Natasha, as they will soon publicly declare their allegiance to Christ their Lord and in His continued grace, pledge their ongoing faithfulness to Him. This is the Lord’s doing, and it is marvelous in our eyes. “12 From the days of John the Baptist until now the kingdom of heaven has suffered violence, and the violent take it by force. 13 For all the Prophets and the Law prophesied until John, 14 and if you are willing to accept it, he is Elijah who is to come. 15 He who has ears to hear, let him hear.” The Kingdom of heaven will continue to advance in the hearts of those who receive it. Whether it is visible for a time, or hidden from our sight, God’s will is done in every generation until our hopes are fulfilled when He comes again and makes all things new. Amen. God created His world good in six days. It was not just a snow globe to be kept on the shelf, but it was made to sustain and provide for life on earth. Our planet, placed in perfect distance from the sun, with an atmosphere and ecosystem that are self-sustaining and able to bounce back even from adverse conditions. What a wondrous place earth is, and what an amazing thing life is here. Our human observation can only scratch at the surface of God’s creation with the disciplines for studying the stars, makeup of the earth, animal life, and the human body. But who is able to understand what has happened to God’s good creation since Genesis 1 and 2? Why are there eyes that do not see, bodies that do not form right in the womb, wasting disease that overcomes internal organs, etc.? Why was this official’s son ill, and why when he says “ill” do we have an endless list of maladies that could have brought him to the point of death? The Epistle reading from Ephesians 6:10-17 exposes what happened to God’s good creation. The Evil One, Satan happened to it. Within God’s beautifully-created world, and likely without delay, the devil tempted Eve and Adam and brought sin and death into this creation. In a sense, we are collateral damage in Satan’s prideful war against God. The most potent way for Lucifer to get back at the God against whom he rebelled was to go after the crown of God’s creation—man. But God is not bested by a fallen angel, either in the Garden of Eden or in Capernaum. 48 So Jesus said to him, “Unless you see signs and wonders you will not believe.” 49 The official said to him, “Sir, come down before my child dies.” 50 Jesus said to him, “Go; your son will live.” The man believed the word that Jesus spoke to him and went on his way. The war is now waged within human hearts. Satan attacks to destroy any true hope in God. He would rather hold our hearts in slavery, captive by the fear of death and an aversion toward the true God. Within the heart, he arouses demands that the Almighty bow down to our command: Unless you show me a sign, I refuse to believe. Unless you change to meet my criteria, I cannot have you as my Lord. Unless you make my life the way I want it, I won’t trust in you. Lord, if you don’t do this my way, all will be lost. We are equipped by our Lord for the spiritual fight against the Devil, the world, and our own weak, sinful flesh. With temptations to lies, self-righteousness, guilt, and doubt Satan wages war against our souls. The Lord, therefore, arms us against these through His Word and the Sacraments, the Means of Grace. See this at work in the official coming to Jesus about his son. He came in deep distress to be sure, but only a vague knowledge that Jesus might be able to heal his son. With His Word, Jesus exposed the lies that were at work within his heart—don’t rest your faith seeing a miracle or in circumstances turning in your favor. Jesus sends him away and simply says, “Your son lives.” Let your peace come from the Word of God, and the official left believing that Word. 51 As he was going down, his servants met him and told him that his son was recovering. 52 So he asked them the hour when he began to get better, and they said to him, “Yesterday at the seventh hour the fever left him.” 53 The father knew that was the hour when Jesus had said to him, “Your son [lives].” And he himself believed, and all his household. So by the end, the most important thing wasn’t that his son was healed, but that He believed the Word of Jesus in spite of the Evil One’s schemes. Whether his son was alive or dead, the official and his household were adorned with salvation. So how can you be similarly equipped? By being immersed in the Means of Grace. Come to worship often and hear the Word spoken, preached, and sung. Make Bible study a priority over sleeping in or other things. Remembering your Baptism every morning and throughout the day as you are met with your own failings and lose sight of God’s calling to you. Here in today’s service, you are being adorned with the Armor of God: In confessing your sins and receiving the absolution, you are fitted with the breastplate of Christ’s righteousness. In hearing the Word throughout the service—and believing it—you have the belt of truth. At the end of the Divine Service when you are sent out with the Benediction, you walk out readied by the Gospel of peace. But since this is only one hour out of the week, do not neglect the shield of faith, no matter what the circumstance, whether good or poor health, riches or poverty, ease or turmoil, because the Evil One has you in his sights and if your faith fails, any of circumstance can become a trap. God’s creation has become a battlefield, but one where He has won the war against all the powers of darkness. He has purchased and won you from the devil and given you His Spirit so that you believe Him at His Word. Go from this place at His Word. You will live because He has said: “I am the resurrection and the life. Whoever believes in me, though he die, yet shall he live, and everyone who lives and believes in me shall never die.” (John 11:25-26) And it will surely be. Amen. The English translations make a future out of it, but the Greek is present tense. So, which is it? Which is easier to say, “Your sins are forgiven” or “Rise and walk”? Jesus leaves us with this two-edged question, because if we say it’s easier to forgive sins, then we risk thinking too little of what that forgiveness cost. If we say it’s easier to say rise and walk, then we might wonder why God doesn’t seem more active in the world for good. Which is easier? The answer to the question is “Both.” God is able to do all things, but the thing that scandalized the scribes and led them to accuse Jesus of blasphemy, is that God was doing His work the “wrong” way. How could God put His powerful Word on the lips of a man? How could God perform miracles through human touch? But this is the mystery of our faith, that God does do these great wonders, and through a Man, Jesus, who is the Son of God. That fact is the difference between the Christian faith and all man-made religions: God brings salvation through human flesh, we come to know God and His will through His Son, and that the way to paradise and eternal life is a gift which is ours by faith in the merit and works of Jesus alone. Now if we’ve been Christians long enough, we start to become familiar with these things. As the proverb goes, familiarity breeds contempt. What I mean is we believe the word of forgiveness, the words of institution easily enough. But, why do we struggle to believe that God is able to take care of the mundane things of life? There is a tendency for the well-known Bible stories that we learn in Sunday School to become fairy tales when we grow up. Take for instance the Walls of Jericho: “So the people shouted, and the trumpets were blown. As soon as the people heard the sound of the trumpet, the people shouted a great shout, and the wall fell down flat, so that the people went up into the city, every man straight before him, and they captured the city.” (Josh. 6:20) Our sophisticated adult minds think, how could blowing trumpets and shouting cause city walls to fall flat?! There must be some other explanation like an earthquake and sandstone. This reveals what is still lacking in our faith. We find ourselves believing in God in theory, but not so much God in fact. Where is God when the rubber hits the road in life? We just confessed that we believe in Him who created heaven and earth, visible and invisible. But He is right where He has always been. He continues to make Himself known and act for the good of His elect with a mighty hand and outstretched arm. To His children, He gives His Holy Spirit, Who brings us to lament our breaks of faith with God. It’s the Spirit who convinces us that the stories we read in the Bible are not just pious dreams about a fictional God. They are the story of our very same God at work in the world we live in today. Believe His holy Word, believe that He does exactly what He says, and the right response is Amen. Rolled into that is the promise that nothing in all of life—on earth, in the body, even against spiritual evils—is greater than God who wills good for you. It’s seemingly easier that the Son of Man has authority to forgive sins, but if we believe that (and we do), then let us also believe the rest of our heavenly Father’s love and care by which He will bring us through the passing trials of this life to Paradise.